Virtualisation has existed in some form since the early 1970s when the classic trap-and-emulate architecture was invented. Fast-forward to the present day, and things are slightly more sophisticated. But, in the fast-moving industry of cloud computing, the real question is always: where it will go next? Here, we discuss the upcoming trends for virtualisation and hypervisors for the year ahead and beyond. If 2017 will go down in history as the year of the cyber-attack, then surely 2018 must be the year the enterprise fought back. From the spread of WannaCry ransomware to data vulnerabilities such as Meltdown and Spectre, last year saw the number of successful hacks skyrocket as businesses across all industries failed to protect themselves and their customer's data. And, in 2018, the expectation is for hackers to continue to bombard businesses, with the Infosec Institute predicting ransomware will once again represent the most dangerous threat to organisations. But, the times they are a-changin’. Today’s organisations are slowly coming to terms with the fact that, in their present form, they can't prevent every threat. And, according to Gartner, are adapting their security setup to focus on detection, response, and remediation, as opposed to protection and prevention. This trend represents a dramatic shift in enterprise attitudes toward cybersecurity, but how does virtualisation fit into the equation? Well, one of the key benefits of virtualisation is that it provides the ability to isolate and split up the most high-value data and programs. By spinning up multiple virtual machines, managed by a dedicated hypervisor, enterprises effectively perform damage limitation, mitigating the fallout when system security is breached. In short, virtualisation provides enterprises with a valuable opportunity to strengthen their cybersecurity resolve; this characteristic having been a key factor in its continued rise in popularity and one which leads us neatly on to our next trend. Just as cloud computing opened the door to a more flexible and financially attractive way of working, virtualisation is a trend that could revolutionise the day-to-day running of an enterprise. With low initial investments, continuously low operating costs, reduced downtime, and improved scalability, the value of virtualisation is clear. 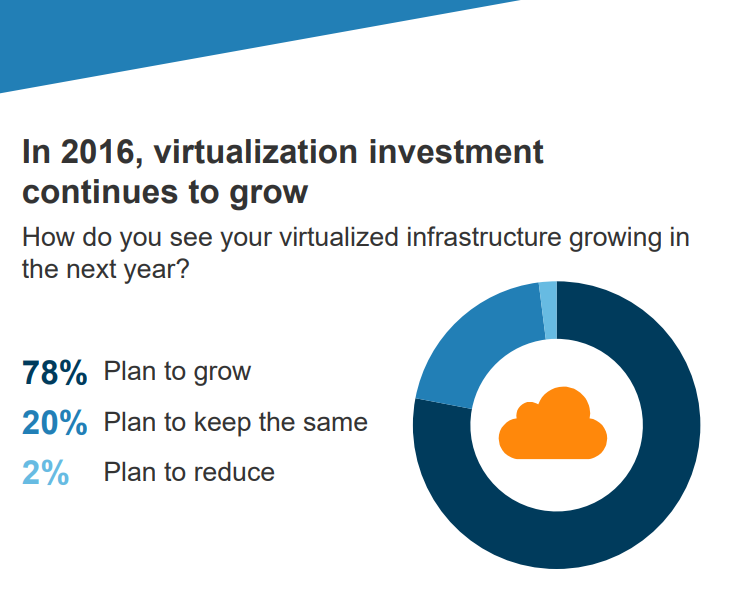 And, according to a forward-looking 2016 survey from Forrester, it is for this reason that 78% of IT organisations plan to grow their virtualisation environments. But, it's not as simple as it may first appear, the report also found that the journey to greater virtualisation is only possible when companies acquire the right cloud management tool, and here is where the hypervisor comes into play. While the benefits of virtualisation and cloud computing are now obvious, that wasn’t always the case, and it's hypervisor technology that has helped drive innovation in the world of cloud computing. The hypervisor makes it possible to manage the concept of virtualisation, often via a comprehensive OnApp platform. By allowing the physical host machine to operate multiple virtual machines as guests, enterprises are able to maximise the use of computing resources and improve the utilisation of underlying hardware. In short, the virtual machine and the hypervisor can provide numerous advantages to organisations, which is why dramatic growth is predicted as we navigate through the forthcoming year. But, as enterprises go about creating more and more data, the question of where to store it becomes significant. Moore’s law refers to the observation that computer processing power doubles every two years. Named after Intel cofounder Gordon Moore, the trend extends far beyond mere processors, and speaks of the ongoing innovation within the technology industry, most aptly referring to data creation. In fact, as the rate of cramming more silicon transistors onto chips has begun to stagnate, data creation has reached unparalleled levels. In a recent Cisco study, it was estimated that in 2018 the total amount of data stored in data centres would reach an estimated 547 EB, approximately twice the global storage in 2016. To allow for this increase, service providers must bring more data centres online with larger-capacity storage equipment. This shift presents enterprises with a new opportunity to take advantage of virtualisation. For example, organisations can utilise the increased cloud storage space to store large data sets, spin up numerous virtual machines to perform wide-reaching and intensive analytics, and then harvest the insights. Using the power of virtualisation, enterprises can gain an up-to-date understanding of current trends and opportunities, customer behaviour and buying patterns, and strategic financial investment. Cloud computing is set to continue its growth in popularity throughout 2018 and beyond. While attempting to battle the oncoming security storm and demand for more places to house their client’s data, enterprises will look to the growth and use of virtual machines and hypervisors to accomplish their goals. If you're one such organisation and feel ready to embrace virtualisation, a great place to start is with the world's largest OnApp provider. Start your virtualisation journey right – get in touch and talk to one of our experts today.